You would have difficulty reading anything about Laura Marling that doesn’t mention her age (you can add this review to that list too). At 21, she’s just released her third album A Creature I Don’t Know, after the huge success of her debut album Alas I Cannot Swim, and its follow up I Speak Because I Can. In celebration of her latest venture, she’s also released a live album, called Laura Marling: Live From York Minster, recorded at the iconic gothic cathedral. After a tour of eleven of England’s ancient cathedrals, a stint at Laneway festival earlier in the year, a solo acoustic set in Sydney’s Paddington Uniting Church, as well as a string of Brit awards and Mercury nominations, it’s enough to make anyone feel like an underachiever. Strings open the live set, but it’s Laura’s acoustic work in ‘I Was Just a Card’ that gives you an insight into the set ahead – the interplay between Marling on her guitar and the band that follow and compliment her. Laura makes full use of her band in ‘The Muse’, another track off her latest album. “You know what I need,” she sings. “Why won’t you give it me?” The track is prime example of the new direction of Marling’s music is taking: layered instrumentals and dramatic intermediate falls and crashes. For fans of Marling’s early work in Alas I Cannot Swim, only two songs feature in the live album. Classics like ‘Failure’, secret track ‘Alas I Cannot Swim’ and early EP single ‘New Romantic’ don’t feature in the set. ‘Ghosts’ comes early on in the record, a small chuckle from Marling acknowledges the huge popularity of the song. ‘Night Terror’, towards the end of the set, the only other song from her debut album, is simply haunting. Her voices carries in the live setting, as she challenges ‘oh fight me’ repeatedly. The newer tracks see a more versatile use of instruments. “I fell in love a bit with the cello on tour,” Laura has said in an interview. “It’s so evocative; there are parts that when we play them live still get me.” Along with a touch of banjo and percussive instruments, it’s never more self-evident than in ‘Salinas’. The darker themes from her new record permeates this set. ‘The Beast’ starts off ratger quietly as it soars into an admission, “Tonight he lies with me”. But the real gems on this album are the solo acoustic performances by Marling. Starting with Laura’s ode to winter, ‘Goodbye England (Covered in Snow)’, the middle section of the set is where the strength lies. ‘Blues Run the Game’ is another contender for best song in the setlist (I had it on repeat for days). Her cover of the Jackson C Frank is simply amazing. “Catch a boat to England baby, maybe to Spain. Wherever I have gone the blues are all the same,” enchantingly echoes in the church setting. ‘Flicker and Fail’ and ‘Night Terror’ are other notable inclusions in this stage of the set. The final three tracks of the record are a full showcase of Marling’s band, in ‘Sophia’, ‘Rambling Man’ and ‘All My Rage’. A fitting end to the set, ‘All My Rage’ is an energy filled endeavour, with harmonies and strong guitar playing, the catchy chorus will be in your head for days. It’s as if she’s challenging the audience at the end of the set, “I leave my rage to the sea and the sun”. For a live album, there is no banter included in the recordings. Whether this is a bonus or not depends on your own personal view, but her charming stage presence is missed on this album. Smatterings of applause can be heard throughout the recording, but the audience, for the most part, do not feature. Whether this is because of a reverence for her live performance or whether the crowd was unresponsive, we don’t find out. A mark of a good live performance/CD is when it enables you to connect with songs that you weren’t too sure about when listening to them originally. Whether you’ve already had a listen to A Creature I Don’t Know, or whether all these tracks are new to you, it’s an apt introduction to Marling’s new music. Whether you were ambivalent or unresponsive to her newer work, or are loving the new direction her music is heading, Live from York Minster is a worthy listen. 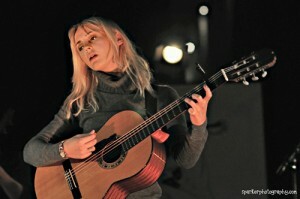 This entry was posted in Music and tagged Album, laura marling, live, live from york minster. Bookmark the permalink.